This site showcases some of my non-commercial still photography; for my video and other work, please visit the main HamishReid.com site. My photography specializes in the familiar — local landscapes and buildings, people, everyday intimacies, household and workplace items — and the collision of the surreal and the familiar that’s always a part of life. The subjects range from urban and desert landscapes, through “people” shots and portraits, to lightscapes, architecture, and manipulated images. Some images here date from the film era; most are digital. Some are from a 4x5 view camera, some from a variety of medium format film cameras; most are from DSLR's and digital point-and-shoots; some are even from my iPhone. And note: the dates mentioned on most images are approximate at best, and may vary by a year or two from reality. For an even more informal take on some of the images here, plus a more expansive set of essays, discussions, etc., visit my Pandemonia site; I am also @jingletown on Instagram, @hamish.reid.photography on Facebook, and The Photolalia on Medium (amongst other things). I also have a separate California And Nevada From The Side Of The Road Tumblr which is basically a place where a lot of the images that wouldn't really fit here end up. I also do the California Driving: A Survival Guide website, an informal and unofficial guide to California driving for travelers and tourists. My videos are usually up on my Youtube channel and / or my Vimeo channel (the latter focuses on the artier stuff at the moment). All images on this site are copyright © Hamish Reid, Richmond, California, unless otherwise indicated. Use the Contact page if you want to get in touch via email (but I'm the world's worst email correspondent). I live in Richmond, California, but I'm originally from both Britain (as it used to be) and Australia, with an accent that tends to be somewhere between those two poles. I'm tempted to say I have no motivation — I can't not do it. It's more of a calling than any sort of motivation. Having said that, I sometimes feel a burning desire to show the world what I see — I'm a glorified reporter, in other words. I certainly have no pretensions to art (I'm an engineer by trade and training, after all). I expand (somewhat incoherently) on these sorts of thoughts over on my Pandemonia site. Almost none at all, and it certainly shows, sometimes painfully. I think where formal training would have helped most would have been in short-cutting my way to feeling at ease with the techniques, the processes, and the business (I did photography professionally for a while, and semi-professionally a bunch of years after that as well). I look at a lot of my early work and think "meh — I could have done so much better if only I'd done a few courses". Not from the subject matter or compositional side of things (I don't think anyone's ever needed to tell me what to take photos of, or to go out there and find myself photographically (urgh)), but from a more prosaic point of view: lighting, colour balance, focus trade-offs, self-promotion, film choices — technical things like that. Have you had any shows? I've done a bunch of small-scale local solo shows over the years, but nothing particularly grand or ground-breaking. I don't fit well into either the art side of things or the explicitly socially-committed side of the photography world, and I'm not well plugged into the photography world in general, so I have low expectations here. Why are there so few "people" images here? I've done literally thousands of "people" photos over the years, but very few of them are up here, even though many of the best were done with signed formal releases. Why so (comparatively) few, then? Mostly because I have scruples about showing recognisable people up here; my article "Nakeds" on The Photolalia sort of discusses this in relation to my "nakeds" (they're not nudes, that's for sure), but it's even true for my attitude towards non-naked people shots. I may slowly start easing up on the scruples; we shall see. Until recently I had a studio in the Jingletown district of Oakland for maybe fifteen years; before that I had a more makeshift one in Berkeley. I had to leave all that behind when I decided the inevitable overnight 50% rent rise reflected an Oakland I no longer recognized…. I miss having my own studio, for sure, but I'm not likely to try to build another one. Do you sell prints of these images? I can sometimes be persuaded to do this, but I'm not enthusiastic, and I never (ever!) do framing or matting, which sometimes (when you've miss-cut your fifth matte in a row) seems like some of the most soul-destroying work a photographer can do. If you really want a print, get in touch via the Contact link on the menu. Nowadays, mostly my Nikon DSLR, my aging Canon Powershot G12 point and shoot, or my iPhone. Back in the film era, I used to use a Sinar A 4x5 view camera, a variety of medium format gear (especially my indestructible Pentax 67), and a Nikon FM2n. My first ever camera was a Pentax Super-A 35mm SLR. Lenses? On all of the different cameras and formats where I could change lenses, I've always had 28mm, 50mm, and 100mm 35mm-equivalent lenses (or close enough, anyway). I don't have any super-wide or fisheye lenses, nor anything longer than 200mm. And, yes, all my lenses are zooms nowadays, and why not? Do you get irritated at being asked about your cameras? I know that a lot of serious photographers think these sorts of questions are either insulting or miss the point, but I think it's those photographers who miss the point. When someone asks me what sort of camera or lenses I use, I think they’re really asking what sort of gear can get the shots I get without too much hassle (and, by extension, whether they have the sort of gear that can get shots like that). Which usually leads me to a discussion about the different types of camera (iPhone, point-and-shoot, DSLR, etc.) and their trade-offs, rather than specifics, which (again) is usually what they’re really asking. They know they can’t get that long-lens shot with an iPhone — but they typically don’t know what camera and / or lens can get that shot. So I'm always fine with being asked. Oh, that's easy — nowadays it's my iPhone, by a long way, followed (for general purpose use) by the G12. In the film era, it was my Pentax 67. Do you have any recommendations for a camera? Do you get nostalgic for the film era? Not at all. See my Going Against The Grain: Film As Lifestyle Accessory for some of the details (the title alone probably says all that needs to be said anyway). What's your take on instagram? Predictably, I love it. I've even got an Instagram gallery here somewhere. I'm @jingletown there, and have been for years. See also my mini essay on the subject on Pandemonia from a while back. Do you use autofocus / auto metering / program mode / etc.? Yep. All that and more... when it helps. Which is most of the time. Otherwise, having used manual-everything cameras for years before the revolution, I'm quite capable of reverting to manual. But why? My Nikon's often better than me at quick-paced decisions in bad light or difficult situations... (and I like the way my iPhone gives me almost no choices at all). Why don't you do nice landscapes? I do!!!! Well, I think they're nice. But if you want good beautiful landscapes (and much else besides), done properly, check out Tony and Pam Bamford's Mostly Landscapes. I've been friends with both of them since my London days, and have done several photo trips with them here — they know what they're doing, and how to do it, and their landscapes put mine to shame. Do You Use Photoshop To Manipulate Your Images? If you mean more than just playing with the levels, or simple cropping, the answer is yes, of course I do. There's even a whole gallery here somewhere devoted to it! But I almost never do it for other purposes or on my "straight" reporting images (landscapes, architecture, or people) -- I'm one of those people who actually likes having electricity poles and wires in his images, blemishes on his human subjects, or gratuitous human activity marring pristine scenes (you might have noticed). But having said all that, I sympathise with Tony on this... even though (again) almost none of the photos in the non-manipulated galleries here have that sort of extra manipulation or editing done to them (and I try to identify them when they are manipulated). I like those bland grey skies! And I often resort to de-saturating images a bit — sometimes that California landscape look just looks, well, a little unbelievable to anyone who hasn't lived here a while. Do you belong to a photo club or do photo competitions? No, I've never belonged to a club or done that sort of thing (competitions, etc.) — it's really not my cup of tea. Actually, I was a member of The Camera Club in London when I lived there (and when it was just off Leicester Square), but that was almost entirely for the convenient darkroom rentals; the only time I entered a competition there was a comically-humiliating episode for me). 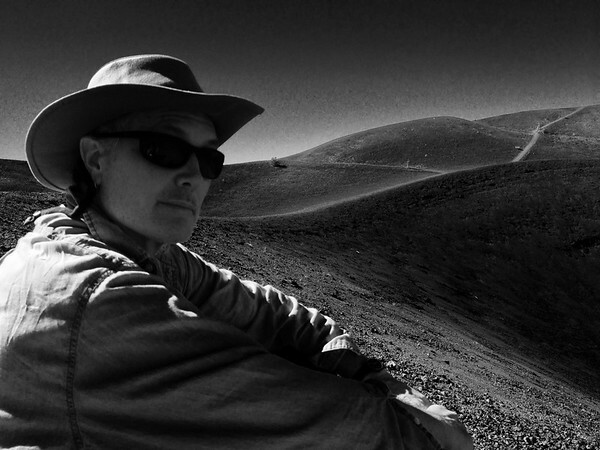 Hamish Reid on the Cinder Cone, Mt Lassen area (California), 2015.